Dried anchovies or Indonesian calls ‘ikan Teri’ is often used in Indonesia cuisine. There are different kinds of dried Anchovies sold in Indonesian market since the country is rich with seafood product. Usually Indonesian cook with other food ingredients like tempeh, potatoes or eggplant. 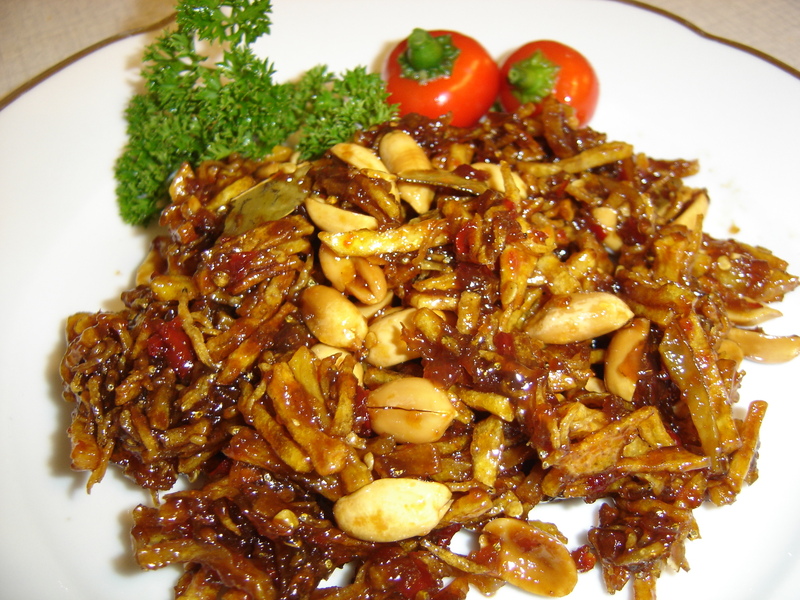 Kering Teri/Sambal Goreng Teri is a combine of fried anchovies (I use Teri Medan) with potatoes and fried peanut. Taste is mix of sweet, sour, spicy and salty. Nano-nano (means different kinds of taste) we call it. This side dish is really good to eat with Yellow Rice (nasi kuning). 3. Heat 1 tablespoon of oil, then sauté the paste with Salam leafs until fragrant. 4. Add the sugar, salt, and tamarind juice and continue cooking until the sauce thickens. 5. Then add the potatoes, dried anchovies, and fried peanut. Mixed them together with the sauce and continue cooking for few minutes.